FIGURE2 ■ Balloon dilation of retroperitoneum. Positioned between psoas fascia posteriorly and Gerota's fascia anteriorly, distended balloon (800 cc air) displaces Gerota's fascia-covered kidney anteromedi-ally, allowing straightforward access to renal vessels. aOrigin MedSystems, Menlo Park, CA. FIGURE3 ■ (A) Initial balloon dilation is performed posterior to lower pole and middle of kidney. (B) Secondary dilation is performed in more cephalad location along the undersurface of diaphragm. (15 mmHg), and a 30° 10 mm laparoscope is inserted. Two or more retroperitoneal landmarks should be identifiable immediately: the psoas muscle, Gerota's fascia, lateral peritoneal reflection, ureter, renal artery pulsations, aortic pulsations (left side), and partially collapsed vena cava (right side). The psoas muscle and one or more of the following structures can be visualized with the following frequency: Gerota's fascia (100%), peritoneal reflection (83%), ureter and/or gonadal vein (61%), pulsations of the fat-covered renal artery (56%), aortic pulsations (left side; 90%), and the compressed, ribbon-like inferior vena cava (right side; 25%) (10). Usually two, and rarely three, secondary ports are placed. All ports are 12 mm for 3-port retroperitoneoscopy, although the port for the nondominant hand may be a 5 mm port. The anterior port is inserted near the anterior axillary line at least 3 cm cephalad to the iliac crest. A posterior port is inserted at the junction of the lateral border of the erector spinae muscle with the under-surface of the 12th rib. Commonly, this posterior port is inserted under laparoscopic control, although rarely, when this port is too close to the primary port to allow reliable endoscopic viewing, bimanual control may be employed. 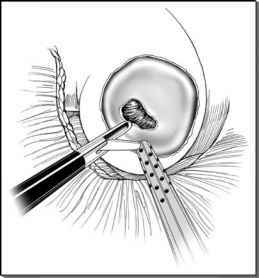 In the bimanual technique, the laparoscope and the Bluntip trocar are removed. For a right-handed surgeon, an S retractor, cradled by the surgeon's left index finger, is inserted within the retroperi-toneum through the primary port site incision. The secondary port is inserted by the surgeon's right hand at the predesignated site at the lateral border of the erector spinae muscle and directed onto the S retractor. The S retractor protects the surgeon's left index finger from injury. Rarely, a fourth port (2 or 5 mm) may be required at the level of the primary port in the anterior axillary line for retraction of the adrenal gland and kidney anteriorly. 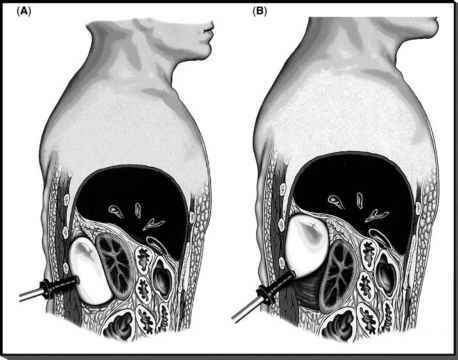 This is sometimes required in the event of an inadvertent peritoneotomy, necessitating anteromedial retraction of the peritoneum. The three ports should be as far apart as possible. The anterior port should be 3 cm cephalad to the iliac crest; otherwise, the bone compromises its maneuverability. Clear laparoscopic observation during port placement is imperative to guard against injury to the peritoneum (anterior port), great vessels (posterior port), or pleura (the occasional fourth port).